One of my favorite events Juniata has every year is the Liberal Arts Symposium, or LAS for short. Each year, classes are cancelled for the whole day, and students and faculty are encouraged to travel across campus and attend student presentations about work/research they have done during the year. There are a lot of different types of presentations, and most common presentations are often in the sciences. This year however, I was able to present my own work at LAS, with focus on the Theatre Department. This semester, I decided I wanted to do an independent study with one of my professors, Leigh Hendrix, and I wanted to attempt to write a full-length play. I have written several short plays (10 minutes or less) throughout my time at Juniata, but I have never tried to write something as complicated and in-depth as a full-length play. I came up with the idea to write a murder mystery, because that is my favorite genre to read/watch. I’ve always loved crime shows and mystery novels, but I never realized just how difficult it is to write a mystery yourself! There is so much background work that needs to occur before one even starts writing in order to create a successful, fluid piece. Once a week, Professor Hendrix and I would meet to look at my writing progress, and map out the entire storyline of the play. I honestly didn’t think I would finish this semester. I know that it sometimes takes years for people to complete a play, and shoving this project onto my already packed work load was definitely difficult for me. However, a few weeks ago I managed to finish a first draft! As soon as I finished the draft, it felt like I had given birth! I had worked hard toward this goal that I didn’t think I would reach, and I did! Over the following few weeks, I printed out the entire script and edited it over and over again. I then recruited a bunch of my friends to aid in my presentation for the Liberal Arts Symposium. The cast of the staged reading of “Airborne”, an original murder mystery play at Liberal Arts Symposium. Since I was just doing a public reading of half of the play, it was a less strenuous rehearsal process, since the cast only had to meet once the read through the piece before presenting it at LAS. 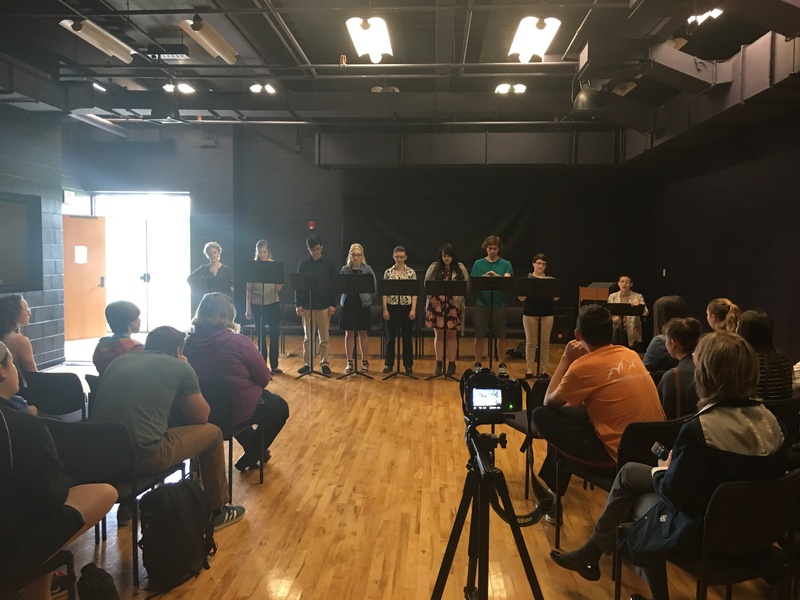 My play has eight different characters, so I had to ask a lot of different people to be involved, but everyone did such a great job reading their character at the presentation! After the reading, my mentor facilitated a talk-back session, where I could ask questions of the audience and receive feedback about the process. My first question to the audience was: Who do you think did it? To my surprise, although the audience guessed five different characters, none of them had correctly guessed the killer! That was definitely a confidence-booster for me, and it showed me that I wrote a really great play. I received such amazing feedback from the students and staff and outside audience members who came to listen to the reading. It truly was an amazing moment of pride, excitement and joy to hear my words being read out loud, and receiving positive feedback from so many peers. Although the semester is coming to a close, that does not mean my work on this play is done. For most, a play is never done. There are always changes that can be made. I hope to keep editing this play and make it longer and stronger, and hopefully be able to stage the show at some point next year! Overall, the Liberal Arts Symposium was such a great experience for me to present a project I had put so much effort into, and see how others reacted to it. I can’t wait to keep working on my play! 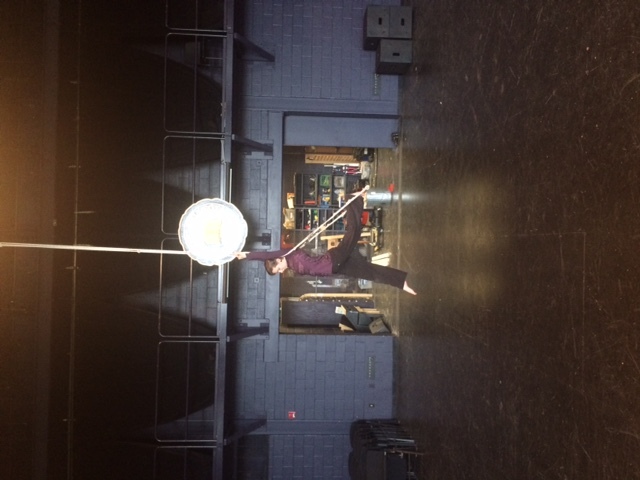 Julia LaPlante (’17) practices her solo performance. 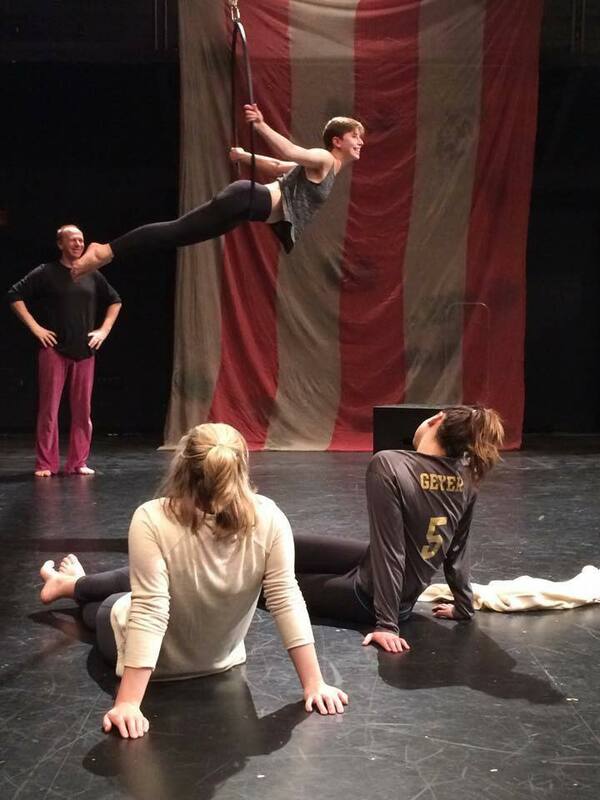 Recently, we have been working with Leigh Hendrix, an actor and theatre performer based in New York, who is serving as our mentor for our solo performances. 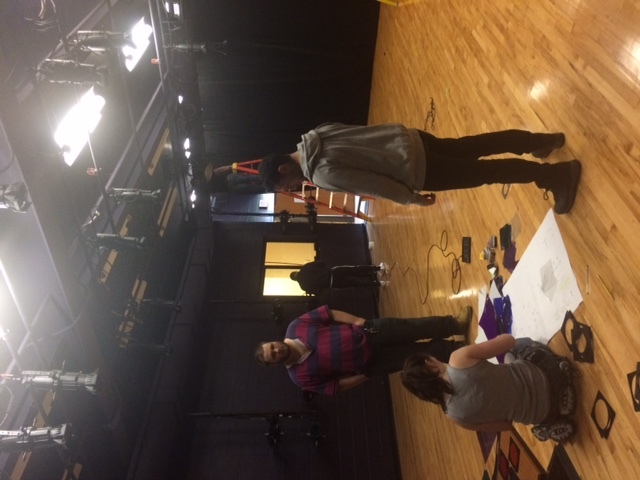 Each student in our Performance Lab class has created a seven-minute piece, and is starring in it alone. The themes and stories are all incredibly different, and my classmates have worked to portray a multitude of diverse characters. For my solo, I wrote a short play called “Out of My Head”, which shows the struggle of a girl who is arguing and sometimes being controlled by the voice in her head (which I believe everyone has had some experience with at some point). I will be playing the girl and the voice at the same time, switching back and forth between the two simultaneously. Playing two characters at once is something I’ve never done before, so I’m really excited to continue working with my play in rehearsals. I probably re-wrote my script a dozen times, always tweaking and changing little things here and there until I found a draft that I am very satisfied with. As an actor and playwright, it’s nearly impossible to find “the perfect draft” of a play because every time you read it, or listen to it being read, you find new things you want to change. It’s a really fun but strenuous process. 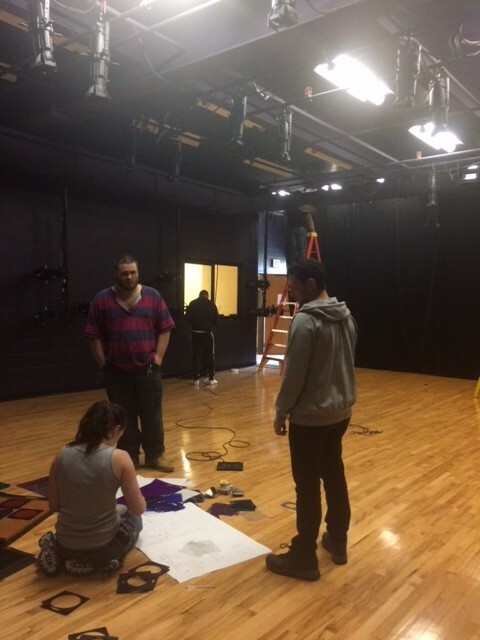 Theatre Practicum students work to set the stage for Solos in the Movement Studio. 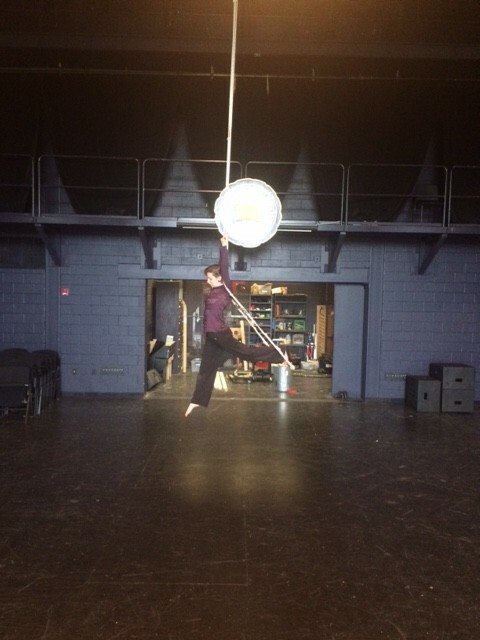 Solos are being performed April 20th, 21st, and 22nd in both the Suzanne Von Liebig Theatre and The Movement Studio. Since there are eleven students in our class, we split the group in half, so six will be performing in SVL Theatre, and five in the movement studio. I definitely recommend coming to see a performance, because it’s really amazing to see some of the work Juniata’s performers can do. If you want to see all of the student’s pieces, you’ll need to come two nights (since you can only be in one space at one time). My friends and I have worked really hard on these original pieces, and I can’t wait until we can show everyone! The spring semester theatre production of “Hamlet” opens this week and I am so incredibly excited. Not only are they performing this weekend and next, but they get to travel to the Edinburgh Fringe Festival in Scotland in August! I was not cast in this show, but just because you’re not cast doesn’t mean you have to sit on the sidelines and watch from afar. I hopped on the opportunity to work backstage with the costume crew. This was my first experience working on the technical side of theatre, but my supervisors were appreciative, understanding and helpful with our tasks. I was a little embarrassed to admit I didn’t know how to sew, but the costume designer for the show, Tara Webb, taught me everything I needed to know. I worked to sew buttons and labels while she made alterations to the actor’s costumes. so amazing to see them killing it on stage! Not to mention, “Hamlet” is not an easy show! Any Shakespeare play has some serious memorization and text work that needs to be done before the play can even begin to be blocked in rehearsal. 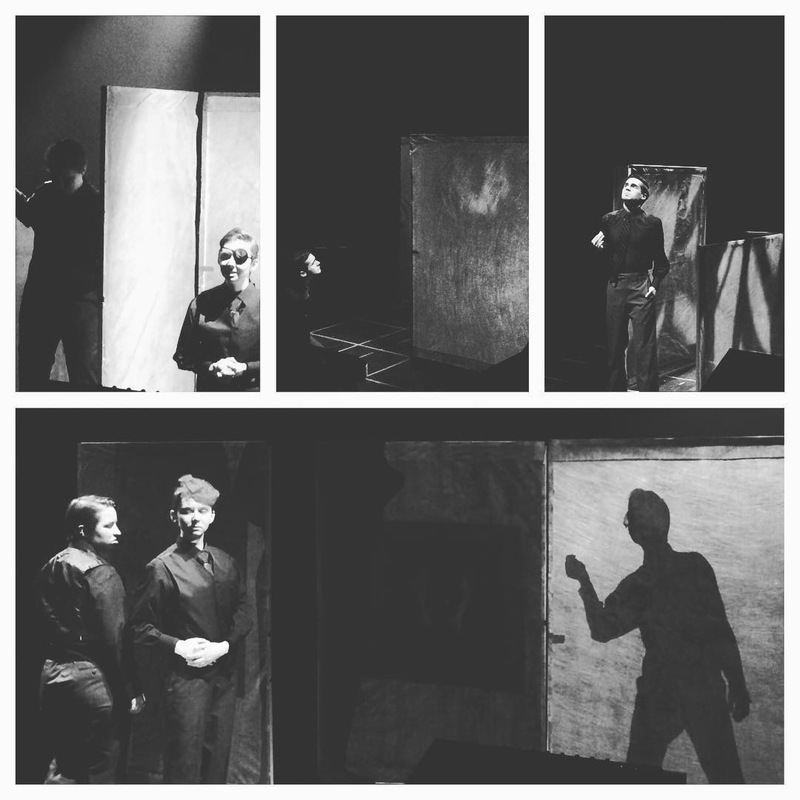 “Hamlet” opens this Thursday, February 18th, and will perform the 19-20, and the 25-27th as well. There is a male cast and a female cast, and the casts alternate each night. I’m so proud of my friends for all of the work they’ve put into this show, and I’m so glad I can be a part of it, even thought I’m not in the actual show. 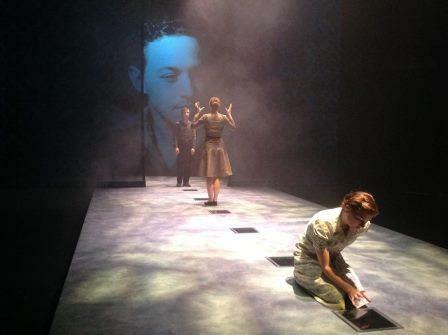 Andrew Kilpatrick (left), Lauren Dobbs (middle), and Megan Smith (right) in The Glass Menagerie. As a theatre POE, it’s my goal to participate in as many productions as possible, or at least attend the ones I’m not a part of. Tonight I had to opportunity to attend Juniata’s production of The Glass Menagerie, a play by Tennessee Williams. I decided not to audition for this show in fear of over-scheduling myself at the beginning of my first semester. After seeing the play, and all of the hard work the cast and crew has put into it however, I am seriously regretting my decision not to be involved. The cast of The Glass Menagerie is a small, four characters. Andrew Kilpatrick plays Tom, the protective poetry-writing brother who works to support his family. Megan Smith is Laura, the incredibly shy, crippled sister who believes she will never amount to anything. Lauren Dobbs plays Amanda, the faded southern belle mother who struggles to accept the flaws of her children. Finally, a friend of mine, Jamison Monella is Jim, an old high school acquaintance who strives for success and love in his adult life. I’ve been taking two theatre classes this semester, and have become very close with my teacher and academic adviser Kate Clarke. We spoke about the production and how incredible the shows at Juniata always are, so I knew I had to see the show for myself. I was blown away. I’m used to seeing musical theatre productions with large casts of at least forty, with show-stopping musical numbers and intricate choreography. The Glass Menagerie was not one of those shows. This production gave off an eery, realistic vibe that pleasantly surprised me. The acting done by my fellow peers was phenomenal! The students seemed comfortable, and were incredibly believable on stage. It’s hard to truly justify the talent I witnessed tonight, so if you get the opportunity to attend this show or any other theatre production Juniata offers I definitely recommend trying to see one. As we progress into the midway point of the semester, I have been able to think about how I’ve been doing so far at Juniata, and what I can do to better enjoy myself here. The first thing I always think about is getting more involved in the events going on around campus, and especially in the Theatre Department. Although I don’t think I will have time to participate in the other performances occurring this semester, I am definitely making sure to audition next semester!